Farrar, Straus and Giroux, 9780374202316, 304pp. All it takes is a quarter to change pediatric psychiatrist Dr. Owen Lerner's life. When the coin he's feeding into a parking meter is struck by lightning, Lerner survives, except that now all he wants to do is barbecue. What will happen to his patients, who rely on him to make sense of their world? More important, what will happen to his family? The bolt of lightning that lifts Lerner into the air sends the entire Lerner clan into free fall. 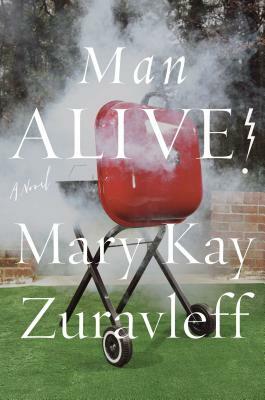 Mary Kay Zuravleff depicts family-on-family pain with generosity and devastating humor as she explores how much we are each allowed to change within a family—and without. Man Alive! captures Owen and Toni Lerner and their nearly grown children so vividly you'll be looking over your shoulder to make sure the author hasn't been watching your own family in action. Mary Kay Zuravleff is also the author of The Bowl Is Already Broken, which The New York Times praised as “a tart, affectionate satire of the museum world’s bickering and scheming,” and The Frequency of Souls, which the Chicago Tribune deemed “a beguiling and wildly inventive first novel.” Honors for her work include the American Academy’s Rosenthal Award and the James Jones First Novel Award, and she has been nominated for the Orange Prize. She lives in Washington, D.C., where she serves on the board of the PEN/Faulkner Foundation and is a cofounder of the D.C. Women Writers Group.